Gordon Lightfoot (whose signature lyrics from If You Could Read My Mind are reflected in the post title) turns 75 this November, and Bob Dylan has said that when he listens to a Lightfoot song, he “wishes it would never end.” That’s pretty high praise from a fellow septuagenarian maestro. Perhaps this is because seasoned songwriters instinctively weave life’s essence and lessons into a succinct truth that resonates to the marrow with those who listen, and thus appe als across the decades to both original fans as they age, and to a new audience. “It is not how old you are, but how you are old,” said Academy Award-winning actress Marie Dressler. We’re moving from a model that focuses on disease, disability and death to one of “passion, purpose, and participation,” which happens to be the tagline of COPA (Collaborative on Positive Aging), a new volunteer division of the Council on Aging in one California community. At the initial COPA gathering, much of the guiding wisdom for how future meetings might be organized was provided by people in their 70s and 80s, such as: “To remain vital, we need a mix of social/learning/leisure/contribution.” How perfect a reminder to anyone who serves seniors — reverse mortgage professionals obviously included — that as people age they become not a group apart, but more of who they’ve been, with a blend of needs and desires to enrich and fulfill these later years. Consider the Sun City Poms, Arizona cheerleaders whose minimum age requirement is 55, along with the requisite “dance skills of rhythm, agility, poise, energy, and showmanship for performing. Acrobatics and baton twirling are a plus.” Wow! These women are weaving their social, leisure, learning and contributing into a bountiful blessing for everyone. The seniors reverse mortgage professionals serve today are playing a vital role in constructing the future of humanity, as they (and we) reinvent what it means, and what it “looks like”, to be “old”. Take care your concern doesn’t come across as if you think your parents’ intelligence is diminished. Are bills piling up on Mom’s kitchen table? Are you worried Dad might fall prey to a scam? 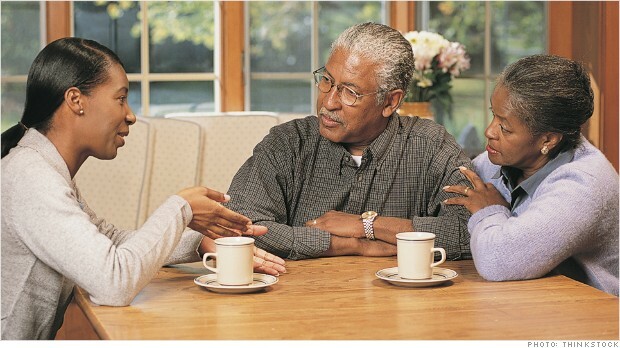 Time to discuss if they need help with their finances. Proceed carefully because they may not see things as you do: A 2012 Fidelity study found that while 24% of adult children think their parents will need a hand with money, 97% of the parents do not. “Conversations about money with your elderly parents are really about control — something they don’t want to lose,” says David Solie, author of How to Say It to Seniors. Try these tips. Drop the attitude. An I-know-better air will put their backs up. Take care your concern doesn’t come across as if you think their intelligence is diminished, says Solie. Bring in a third party. To your mom and dad, you will always be a kid — which is why the talk may go better if you deliver it alongside an outside expert, says Paula Span, author of When the Time Comes. The strategy: Being straightforward — “Mom, Dad, you need to watch out for people who ask for your bank account online” — may feel patronizing to your parents. Instead, plant a seed that doesn’t reflect on their competence to manage their affairs, says Colorado elder-law attorney Catherine Seal.